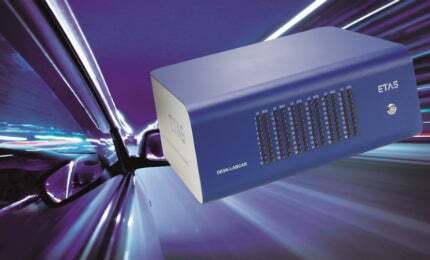 ETAS provides innovative solutions for developing embedded systems used within the automotive and railway industries. ETAS draws upon the skills of more than 930 associates, and is a 100% owned subsidiary of the Bosch Group. ETAS operates ESCRYPT, which offers embedded security solutions. ESCRYPT’s services range from expert consulting and IT security products, right through to customer-specific implementations of entire solution packages for automotive and non-automotive applications. The challenges faced by embedded software engineers are multi-dimensional, remaining focused on the achievement of efficiency and product quality at all times. The ETAS business approach addresses these market challenges, anticipating upcoming developments to provide customers with the right answers, in every field of the embedded software development process. ETAS solutions are open, scalable, flexible, and based on standards. They can be easily integrated into the existing customer’s tool and process environments, making ETAS solutions reliable companions during the entire embedded software lifecycle, and through every phase of electronic control unit (ECU) software development. ETAS has now transferred its expertise in embedded systems industry to the railway market, dealing with several leading customers worldwide (e.g. model-based software development of braking systems for rolling stock, and calibration of diesel engines). A broad portfolio for railway embedded systems is provided, consisting of tool solutions, consulting, and engineering services. The synergies that arise provide an advantage for the successful development of embedded software in the railway market. With long-standing embedded systems expertise, ETAS delivers excellent products throughout the entire rail industry. ETAS has years of proven experience in the development of embedded software systems, with one billion operating systems on the road. ETAS products support efficient approaches to the development of safe embedded software, which complies with industry standards. ETAS is able to deliver customised solutions by offering expert consulting and comprehensive engineering services, as well as on-site support. In order to meet the growing demand for new models of cooperation between vehicle manufacturers, as well as ECU and software suppliers, ETAS offers embedded software engineering services, including design, implementation, and integration of ECU software. Established in 1994, ETAS has offices worldwide, based in Brazil, China, France, Germany, India, Italy, Japan, Korea, Russia, Sweden, Thailand, the UK, the US, and Vietnam. ETAS is a worldwide, well-established organisation. To find out more, use the contact details below. This white paper describes the requirements on a test system which simulates electrical faults of various types. In addition to theoretical examples, it will provide use cases of the ETAS fault insertion tools ES4440 and ES4441. The control of today's complex electronic systems can only be created by costly software functions. With the increasing number of electronic control units, the amount and complexity of functions that engineers must design, code, test, and implement increases as well. A company video from ETAS, discussing their ASCMO product. High-speed trains are an essential part of efficient transport infrastructure in any modern industrialised country. But train travel speeds of up to 250 km/h and more place enormous demands on brake system mechanical components and control electronics. Hanoi Urban Metro (Hanoi Metro) is a metro rail system that will be developed in Hanoi, Vietnam, by 2021.